Week one of the scheduled 60-day session is behind us and we began today with plenty more work, bills and debates. Just 24 hours after the Legislature convened Jan. 8, Gov. Jay Inslee proposed an enormous tax during his State of the State address Tuesday. He calls it a carbon tax, but in reality, his proposal is a tax on energy. Bills introduced in the House and Senate would raise nearly $3.3 billion in new taxes over four years. Half the money from the tax would be paid by power plants and fuel importers, but would ultimately affect consumers in the form of higher energy prices. If enacted, the governor's policy staff said consumers could expect to pay a 4 to 5 percent increase in electricity, a 9 to 11 percent increase in natural gas and higher gasoline prices by as much as 18 – 20 cents per gallon. You can listen to that interview here – Go to 1:07 in the recording. If Washington is serious about a cleaner, greener environment, leaders in Olympia should consider policies that would reduce the over-abundance of fuels in our forests that have contributed to horrific wildfires and massive amounts of carbon output when they burn. Rather than punishing employers and jeopardizing jobs with a carbon/energy tax, why not encourage businesses to invest in carbon reduction technologies by providing tax credits when they reduce greenhouse gas emissions? This concept, known as The Carbon Free Washington Act, has been introduced in the form of House Bill 2283 and awaits a hearing in the House Technology and Economic Development Committee. Why is Gov. Inslee, a Democrat, pushing so hard this year for his agenda of higher taxes, gun control, abolishment of the death penalty and a change in Washington's voter laws? It's because control of the Senate shifted from Republican to Democrat (25-24) during the November election of Sen. Manka Dhingra in the 45th District near Seattle. Both chambers in the Legislature are now controlled by Democrats. Unfortunately, this change is resulting in more bills introduced in the Legislature this year that have a stronger liberal Seattle flavor, such as a new proposal to tax sugary drinks, similar to the sugar tax that went into effect in the Emerald City on Jan. 1. 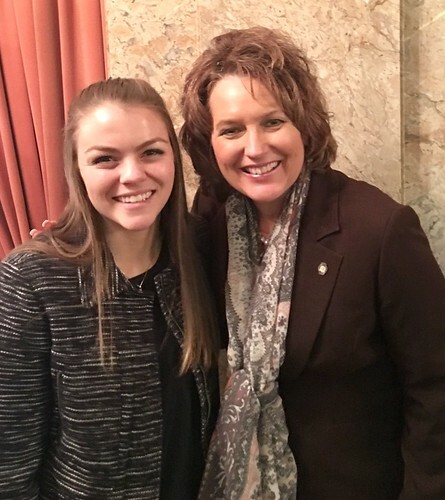 I'm very pleased that one of my constituents, Rachel Case from Camas, a student at Washington State University, is working as an intern in the House of Representatives this year. Rachel is assisting our legislative communications staff and helping with constituent communications for newly-appointed Rep. Carolyn Eslick from the 39th District. I plan to continue my efforts this session to bring commonsense reforms to the overly-burdensome, aging, one-size-fits all Growth Management Act (GMA). In future e-news briefs, I will highlight details of my GMA reform bills. In this brief, I would like to detail House Bill 2524, which I introduced Wednesday, Jan. 10. The bill would require the state Department of Commerce, in consultation with the state Department of Agriculture, to adopt guidelines that would allow citizens to remove land designations made by local jurisdictions of agriculture and forest resource lands where soil samples indicate that composition of the soil is not compatible with its designated use. The problem existing today is lands/properties designated by local governments for certain agricultural or forest use may not have the soil system to support that designation. This designation affects a property owner's land value and restricts the ability to conduct other activities that would be more conducive to the property. My bill would provide a way to have the property re-designated to a more compatible use after a soil test has been conducted at the expense of the property owner. The measure has been referred to the House Environment Committee. Next time. . .Hirst, capital budget and more! Be watching for my email updates. For the past several days, negotiators have been meeting on a Hirst water fix. Hopefully, I will have more details to share in my next e-news brief on the Hirst issue and the possibility of passing a capital construction budget. Please contact my office with your questions on these and other issues. My contact information is below. "Protecting life, liberty and the pursuit of happiness!"